For hairline, 1-hair FU seems natural enough. Then the next question is how many layers should be made. One thing is certain, one layer may not be natural when the hair does not survive. I think that at least 3 layers, and preferably 4-5 layers, are required (Figure 5). One thing I’d like to highlight in this lecture is depth control. There have been a lot of discussions about the transplantation size, but if I’m not mistaken, this might be the first time to discuss depth control. Placing hair follicles too deep may cause folliculitis (Figure 6-1) and cyst (Figure 6-2). Folliculitis typically lasts for about a year, generating a lot of complaints from patients. Failure in depth control leads to serious reduction in survival rate. Of course survival rate is influenced by many other aspects, but depth control seems closely related to survival rate. 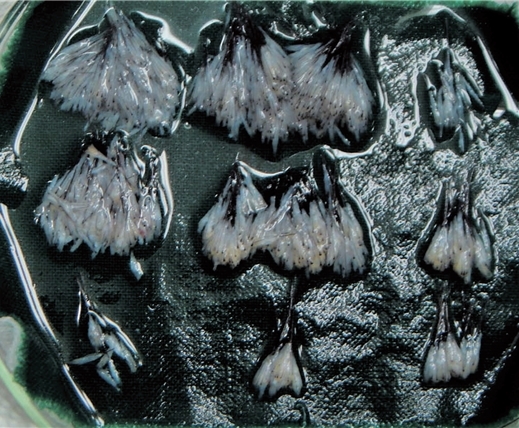 Deep transplantation causes pitting (Figure 6-3) and shallow transplantation causes tenting (Figure 6-4), both of which are not very attractive to see. Then how can be control the depth? People thought that transplanting not too deep was enough in the past. After encountering pitting, cyst and folliculitis, and finding out that they keep developing even after careful transplantations, I conducted a study in this matter. 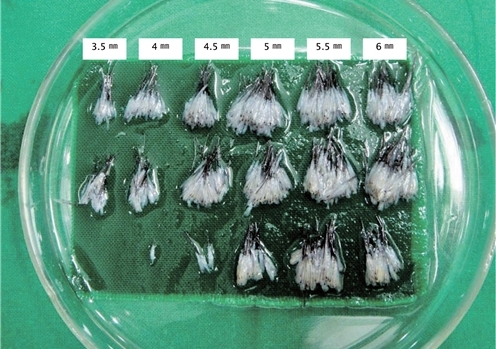 I measured the length of follicles (Figure 7). Of course we know that everyone has different length of follicle, but intrapatient graft length difference had not been studied yet. 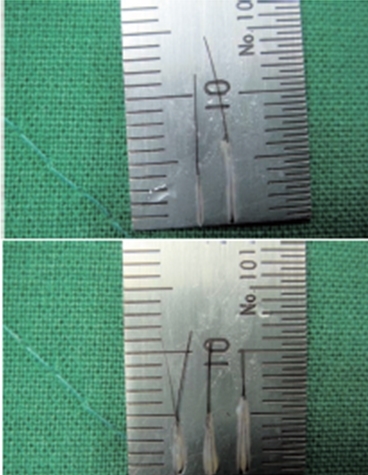 After measuring them, I could find intrapatient follicle length difference (Figure 8). Figure 7. Measurement of hair follicle length confirmed intrapatient follicle length difference by 1-3㎜. Deep transplantation can be prevented by classifying the hair follicles according to their length and adjusting the needle length accordingly. Transplanting all hair follicles in the same depth, despite such difference in length within a person, is subject to problems. For example, if all hair follicles are transplanted at 6-㎜ depth according to the length of hair follicles, some of them may be 3.5㎜ in length. Then this hair follicle would be transplanted 2.5㎜ deeper, which will definitely result in cyst, folliculitis or death inside. Now we know that the depth may be different within a patient, unlike the belief in the past that depth control does not make much difference. Then why did we have such a belief? Because the difference in follicle length within a patient is generally 1-1.5mm at most. About 15-18% of patients have difference in hair follicle length and end up having those troubles. Now, I studied whether depth control could affect the development of cyst or folliculitis. 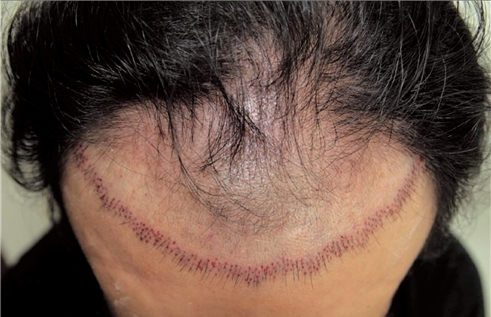 One group received hair transplantation without much care about the depth control, and the other group received hair transplantation with depth control according to the length. 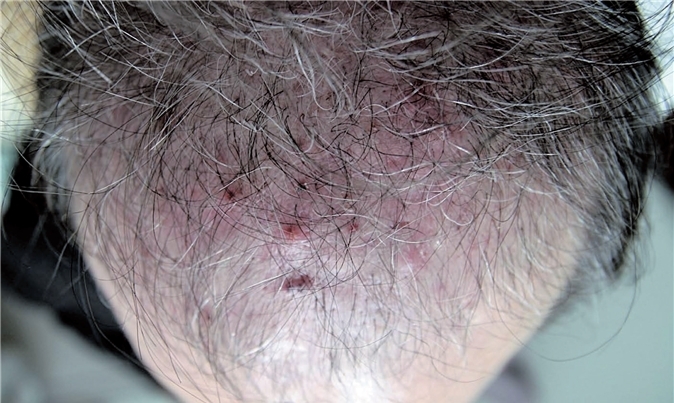 According to the results, the depth control group did not develop a cyst of folliculitis and even had high survival rate for both 1-hair and 2-hair FU (Figure 9). By practicing depth control in the last 1 year and a half, I did not encounter 1 case of folliculitis after hair transplantation and the survival rates were increased as well. 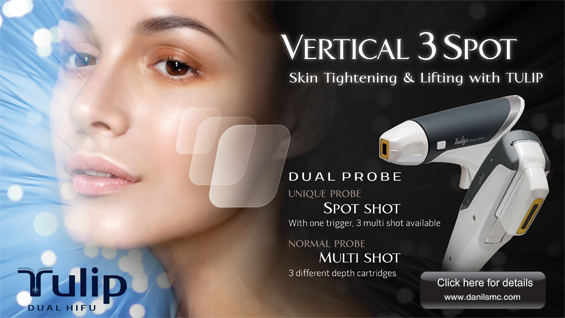 The problem is that our staffs are having a hard time measuring all 3,000-5,000 hair follicles with rulers. Now they are more proficient and have significantly reduced the measuring time. Depth control is also important for pairing. It would be ideal to transplant 1-hair FU one at a time but it is too time-consuming, which is why 2 1-hair FUs are paired together. In the past, pairing was associated with increased folliculitis, because the longer one would be placed deeper (Figure 10). These were the issues worth considering in the recipient area.